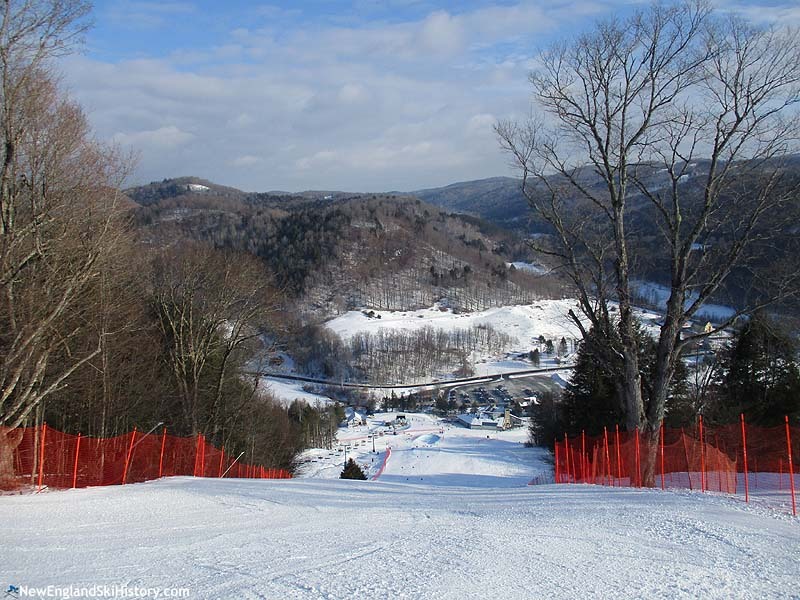 Located north of Woodstock, Vermont, Suicide Six is a historic small but steep ski area. Lift served skiing in the United States likely dates back to the 1933-34 season, when Robert and Elizabeth Royce hired David Dodd to construct a rope tow on Clinton Gilbert's farm to serve their inn's guests. The tow opened in January of 1934. Recent Dartmouth graduate Wallace "Bunny" Bertram soon took over operating the ski area. Bertram later joked that he didn't even have a cash register while he was in charge. Circa the 1936-37 season, Bertram installed a tow on Hill Number 6, noting that it would be suicide to ski straight down the face. One writer joked about the lift being a "90-mile-an-hour speedy pull-me-up." By the time the 1939-40 season rolled around, Suicide Six was noted as having one of the best race courses in the country. Accomplished racers such as Brooks Dodge, Tom Corcoran, Bill Beck, and Betsy Snite competed at the area. Suicide 6's racing creditials especially became known when the area had snow when others did not. When "green grass seem[ed] to be the style" in the winter of 1941-42, Suicide 6 continued to host the Fisk trophy race and also attracted college races that were otherwise doomed to being cancelled. A Poma was added for 1953-54 season, giving Suicide Six a modern lift. 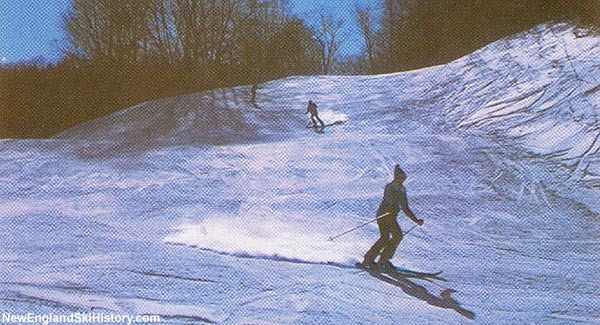 Eight acres of new slopes were added for the 1956-67 season. Bertram sold the ski area to Laurance Rockefeller in 1961, later remarking to Skiing magazine, "I was damn lucky to get out of the business." Rockefeller's RockResorts, Inc. proceeded to market it with its other Woodstock ski area, Mt. Tom, until the latter closed in the late 1970s. Wanting to have "Cadillac" skiing, Rockefeller pushed through a significant expansion in the late 1970s, starting with the installation of a new double chairlift in 1975-76. A new J-Bar was added in 1977, while a second chairlift was installed in 1978. A new 10,000 square foot, $400,000 lodge was also unveiled for the 1978-79 season. In February of 1982, Suicide Six hosted the first National Snow Surfing Championship, paving the way for competitive snowboarding. 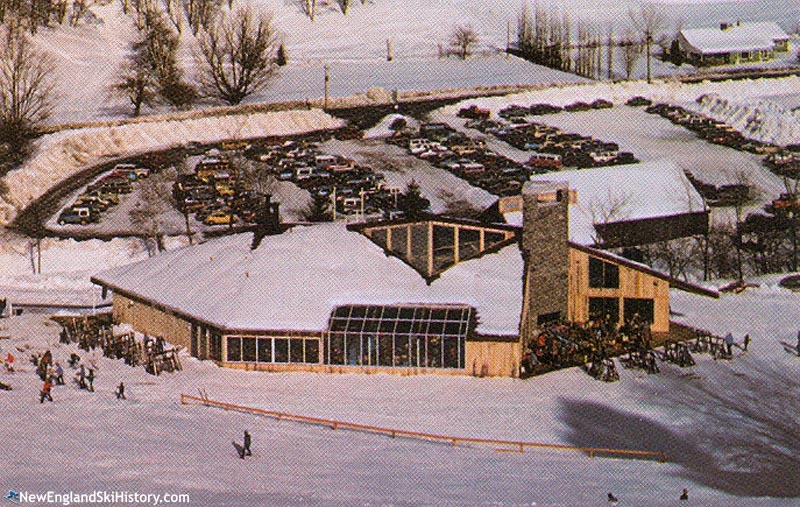 As the 1980s progressed, the ski area was spun off from RockResorts, Inc. prior to the corporation being sold to CSX. Suicide Six and the Woodstock Inn ended up being part of the Woodstock Resort Corporation. After having finding flaws in its aging summit double in back to back seasons, Suicide 6 replaced the lift with a new quad chairlift for the 2016-17 season. Once again embracing an emerging competitive sport, Suicide Six was a venue for the FIS Telemark World Cup in January 2018.